The game's best players flock to the seventh world cup. It may lack the spectacle of football’s greatest stage, but the stars of the Elasto Mania World Cup have just as much power to amaze as the likes of Messi, Neymar and Ronaldo. The long-lived shareware elastic motorcycle puzzler celebrated its seventh World Cup this year with a schedule of virtual apple consumption and intense höyling—a word meaning to play a level endlessly—spread across 15 events in three months. Zweq came to the World Cup fresh from a six-month break from Elasto Mania, and while he ranked among the favourites to win, his own expectations were modest. “That was probably the key to my success,” he reflects. It made him work harder, more consistently. And smarter. 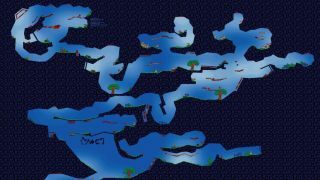 For the first time in his Elasto Mania career—after 14 years in the community, 20 years of obsession with the game and its predecessor and 20,000 hours or so of estimated total playtime—Zweq tried developing his routes with a tool-assisted speedrunning patch. He couldn’t use it for official attempts, but the tool allowed him to save his practice runs at any point and repeatedly attempt the same trick to perfection, without having to worry about redoing everything that came before it. It worked a treat. With route-finding assistance from his teammate, World Cup runner-up Zero, with whom he shared ideas and replays over a Discord server, Zweq was top of the standings after four events, and he bucked past trends by staying there until the end. “I was surprised to actually see Zweq pull through and win,” notes co-organiser Sune ‘Kopaka’ Sørensen. “While he is arguably the best player in the world, and has been for many years, he has never made top results in a big cup.” He would always lose motivation or run out of steam. More than just a contest to crown the best player, the tournament has an important role in maintaining an ageing community. Stamina and motivation seem to be the big equalisers in events like the World Cup. “You’ll always see people who give up after a number of events,” Kopaka continues, “and see people who weren’t doing good in the start suddenly being able to compete in the top because others fall off.” Case in point: 11th-placed Kazan was second when he stopped playing after the seventh event, while seventh-placed Mira and eighth-placed pawq each managed to make the top five in only three events. After competing in all of the previous six World Cups, 28th-placed Tisk was happy just to participate. With less spare time and ever-tougher competition at the top, he says he preferred to sit back and go along for the ride — to play for five hours or so per event and then watch the top replays in awe of the variety and raw talent on display. Event 11 designer and 23rd-placed 8-ball shares a similar sentiment. He admits to lacking the commitment and perseverance to match his top ten ambitions, but he loved seeing the skill on show elsewhere – especially from Zweq, whose winning Event 8 replay was lauded for the speed and effortlessness with which he executed seemingly-impossible tricks like clockwork. Event 8 designer Ramone gushes that he’s seen Zweq’s “perfect” winning replay “well over” a hundred times. “Normally, World Cup wins don’t look that unflawed,” he explains. Ramone went through 118 revisions of the level, which was an experiment in adapting a ‘first-to-finish’ short-yet-tricky battle-type level for the week-long World Cup event format. But he tried to get it pulled from the competition when he saw how hard the prior World Cup events were. He was shocked to see it voted best of the tournament by the community. He even jokes that maybe people actually voted for Zweq’s winning replay, rather than the level itself. After an exhilarating few months, it’s now back to business as usual for the competitive Elasto Mania scene. That means a constant stream of new levels for super-short 15-minute battle events.